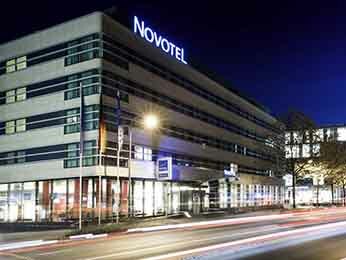 Whether in city center or near to the station or airport, Novotel hotels are ideally situated. Novotel offers a 24-hour reception with a buffet breakfast, Wi-Fi, a large room with a bathtub and a sofa bed for children, who stay for free in their parents' room if they are under 16. With its extensive experience, Novotel has developed real expertise in organizing meetings and hiring meeting rooms: High-speed wireless Internet, presentation equipment, coordination of breaks, fully-equipped room. Keep yourself updated on our special offers, news, innovations and more. Let us look after you with our free Le Club AccorHotels loyalty programme. Enjoy unique offers, exclusive services and more. * Prices from. Terms and conditions apply. Offers are subject to availability. See the price terms and conditions of sale. These prices may relate to different types of rooms. Depending on the country, these prices may be shown before tax, inclusive of VAT, or inclusive of all taxes (VAT and tourist tax). Where prices are not shown inclusive of all taxes, the taxes (VAT and/or tourist tax) will be specified in the following steps of the booking process. Prices are not guaranteed until the booking is made.